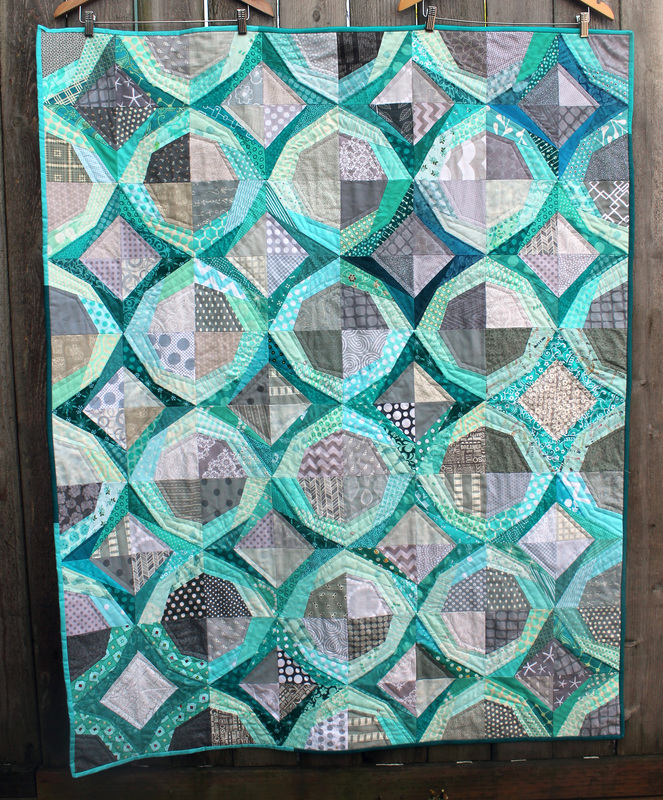 Okay it took me a while but I finally got the do.Good.Stitches Icicle quilt done…. so without further ado here she is…. This quilt started life when I was doing Julie @ 627Handworks “Block Rockin” paper pieced blocks. I loved how the Icky Thump block looked and decided it needed to be a quilt all its own. It took me a while to decide how I wanted to quilt this top up. I ummed and ahhed for weeks about what to do and finally decided to quilt to enhance the star pattern. ..the quilting really works on the back. Now I know I am not noted for my quilting prowess, as my darling friend Lisa confirmed yesterday (I piece like a champion but quilt like a beginner)… but I am chuffed with how this looks. For the backing I used one of the blocks I was sent that was a little small and made it the focal point. This way everyone who contributed a block is represented in this quilt. Finally I hand bound the quilt using some solid scraps I had. It was a lovely exercise to put the finishing touches on this quilt by hand. Another do.Good quilt ready to head off to do good! Backing: Kona Medium Grey and various others. This is such a lovely quilt. The colours are fabulous. Well done. As someone who cannot machine quilt I am very impressed with your result. Love it! I am a paper piecing fan. You did a lovely job! Looks great, Cath. You do good work. This is so gorgeous!!! I don’t know what it is about grey these days, but I just llllove the look of grey-heavy quilts, especially with just one other main color. The back of your quilt is especially gorgeous! I find I like backs even more than fronts sometimes!! Great finish! 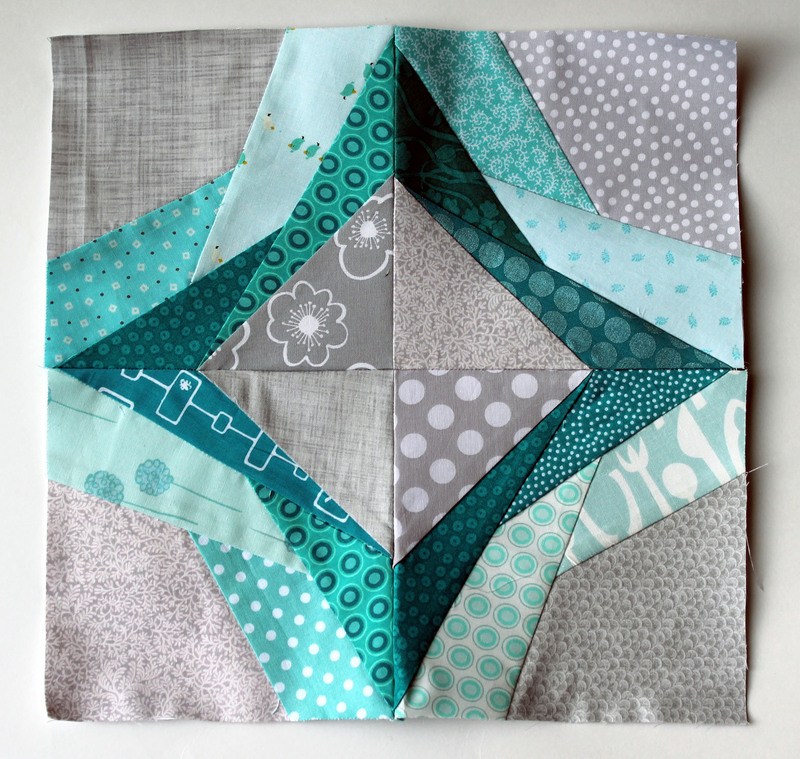 I love all the variety in grey prints present in this quilt! Great finish! Beautiful job! 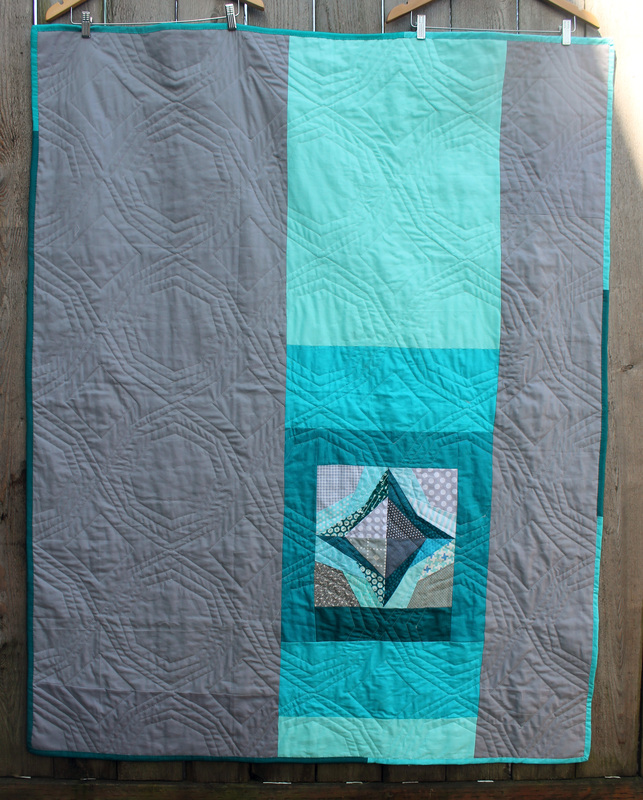 The quilting looks great, and I love the pieced back! how beautiful! 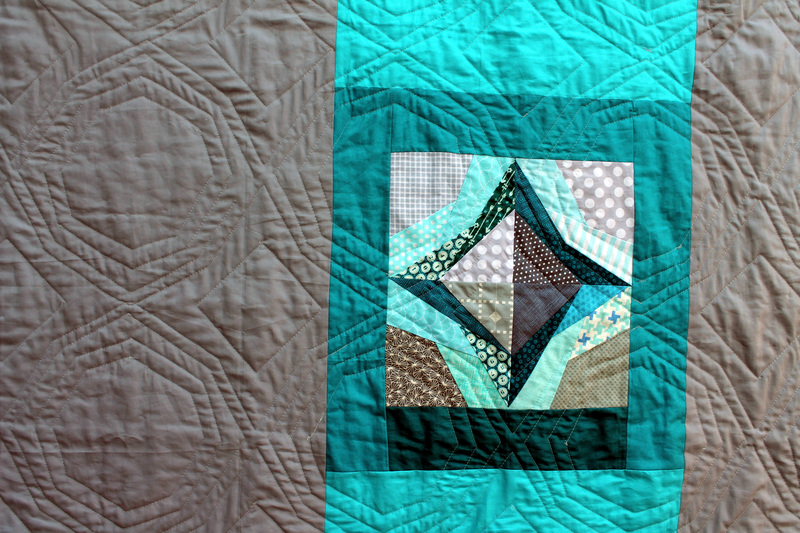 the quilting looks PERFECT with this block! well done! I am seriously trying to up my quilting game…you really do inspire me. I love this quilt–one of my favorites of yours. 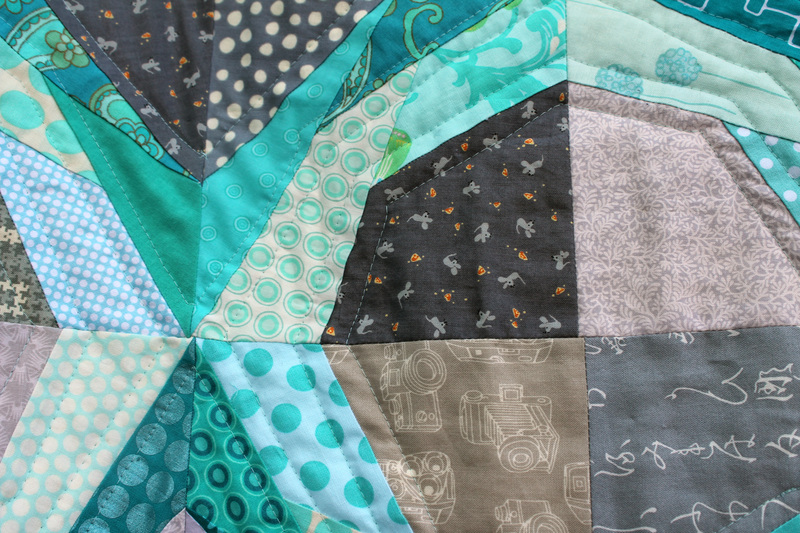 The colors, layout, movement and quilting are all fabulous! Thanks Renee. I do love it too. You did a great job with the quilting and the back! Whole thing look fabulous. I wish I was as prolific as you are. And what does it mean to be “chuffed”? Lynne chuffed means really pleased in British/Australian. Very understated excitement. Brrrrrrr, it’s just gorgeous and so icey. I love it! The colours are superb and the piecing is perfect. You should be super stoked with it. Jen I am really thrilled with how it turned out. It is my first do.Good quilt. Very impressive. I like it. Thanks for sharing. “Chuffed” means really happy, very pleased with yourself which is what Cath must feel now she has finished her lovely quilt. As a Brit I know what Chuffed means, didn’t know it was an Aussie word though. Good oldCommonwealth connections! Quilting is great choice, love the colors..need to go fabric shopping! Ooohhh fabric shopping. I love fabric shopping. Beautiful, cool, crisp icy quilt, lucky someone who will be Done.Good. You are perfectly correct to be righteously chuffed! Totally love this block! Will have to add this to my burgeoning to-do list. Congrats on a beautiful finish! The quilting looks great! It is a great quilt!!! Just beautiful!! If the front wasn’t impressive enough, you go and do that backing! Just fantastic! Great job. I love the colors and am jealous of your quilting. I do not have the patience to do all that spinning, but it looks wonderful. This looks great! A girl in my guild did one similar to this. I wonder if it was the same pattern. I love it! 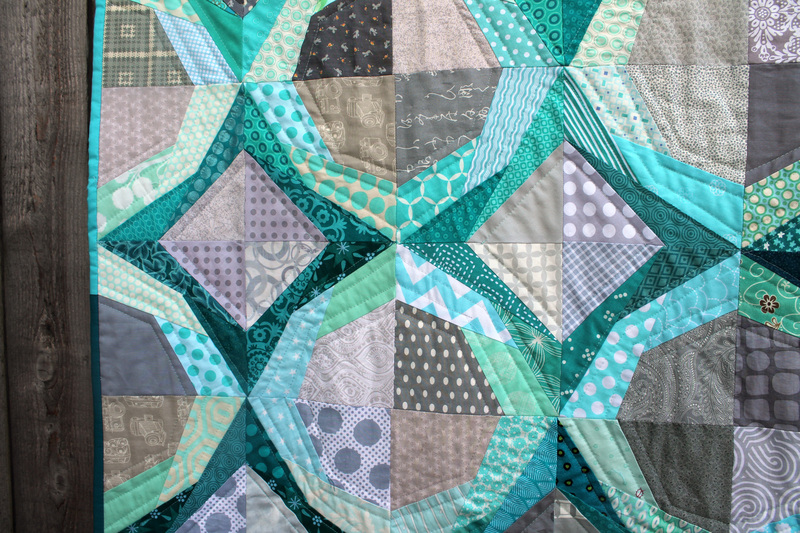 Every time I think I don’t want to learn paper piecing I see one of your fabulous quilts and then I know I have to. I think this one (love the colors) and your other quilts are very inspiring, indeed! And the quilting is just lovely. Thanks Sandra. 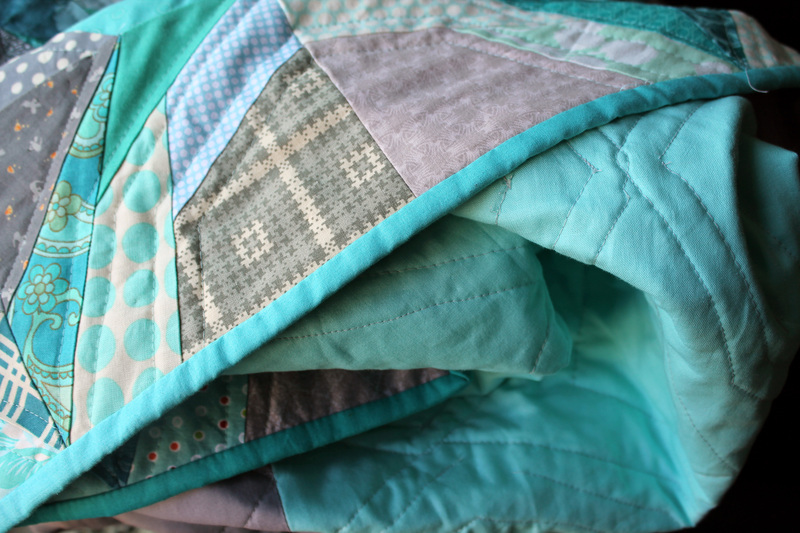 My quilting is getting better…practice is helping but I dream of a long arm machine. As for paper piecing…I highly recommend it. Absolutely gorgeous Cath!! I love every little bit of it. The colours are just gorgeous and used that way with Julie’s block pattern, perfect! I am so glad Linda. The power of a quilt made with love should never be underestimated. Wow that’s beautiful, those greens and greys really work lovely together. Love this ~~ especially the colors! Love this. It’s on my to do list. 2 blocks made! I really like how this quilt turned out. It is fun to see what others have in their stash too. I am so in love with the colors in this one! Beautiful. the finish is perfect! Thanks so much for being one of our quilters!! Natalie it is my pleasure. I love being a part of the Hope Circle. Good call on deciding Icky Thump had to be a quilt all on its own. It is lovely! This is the most stunning quilt I’ve seen in a long time! What a great vision you had and all your design choices created a treasure. You could have fooled me about the “quilt like a beginner” bit. The back especially looks fabulous. All the fabrics come together nicely (not always true with bee blocks!) I love those cameras near the mice.